April 26, 2016 - Ogilvy PR has teamed up with RockDove on an app that will help organizations manage the first hours of a corporate crisis. Ogilvy Public Relations has entered into a partnership with RockDove Solutions to launch a crisis communications planning service in response to the speed in which events spiral out of control and damage reputations in the digital age. The partnership will give clients access to In Case of Crisis, a mobile app developed by RockDove that helps users navigate the best response to a corporate crisis. RockDove said it services over 600 public and private organizations via the app. In Case of Crisis helps users with scenario planning, draft statements, and links to the contact information of the crisis team, among other services, using alerts, text messages, and email, Ogilvy and RockDove said in a statement. The services allow organizations to coordinate their first steps in responding to a developing crisis. Ogilvy’s best practice crisis-preparedness guide will be stored on the app. The two companies said in a statement that they formed the partnership after prior collaborations, in which they created crisis communications planning content for Ogilvy clients. Chris Britton, CCO of RockDove, said the company would be releasing a Windows-compatible version of In Case of Crisis in the next month due to mounting demand. In Case of Crisis is available for download on all standard app stores worldwide, Britton added. "After the pilot program, it became clear that it was going to be a big value proposition," Britton said. RockDove Solutions, developer of the adaptable mobile crisis management solution In Case of Crisis, helps organizations turns their crisis management, business continuity, emergency preparedness, and workplace safety plans into accessible and actionable digital playbooks. 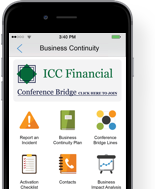 Serving hundreds of public and private institutions, in the rapidly growing enterprise mobile marketplace, the company’s award-winning, customizable crisis app prepares companies to quickly and effectively respond to crises. For more information, visit www.rockdovesolutions.com.